Protect the Peaks! 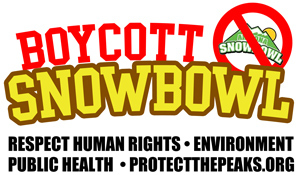 - Corporations Confronted for Roles in Snowbowl Human Rights Violations – Call to Action! 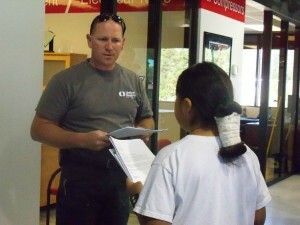 FLAGSTAFF, AZ – On June 15, 2012, more than 20 Flagstaff community members holding banners and signs delivered a letter to RSC Equipment Rentals and their parent company, Stronger United, requesting an immediate halt of construction and withdrawal of their contracts with Arizona Snowbowl. 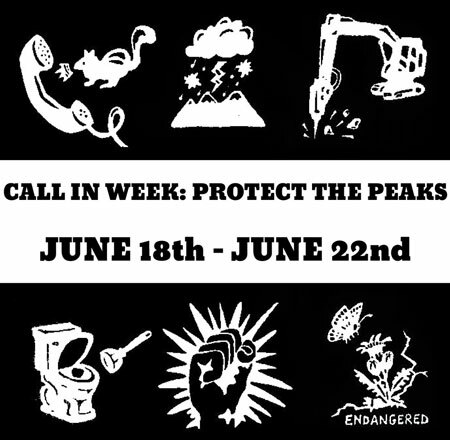 The actions taken today are part of a coordinated effort to address contractors complicit in Arizona Snowbowl’s destruction and desecration of the San Francisco Peaks. Similar letters were delivered to Towsley Welding & Construction in Big Bear, CA and to High Desert Investment Company in Flagstaff, AZ. 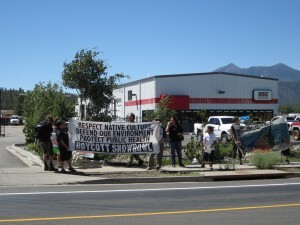 After presenting a letter requesting RSC and Stronger United’s support for human rights in Northern Arizona, community members gathered on the sidewalk, holding banners and chanting. An employee approached the group requesting they leave the area, and then made a number of racist remarks, demanding the group that if they were so concerned about sanitation, they should “go back to the reservation and tell everyone to clean their yards.” The employee then pushed Toby Manuelito before leaving. A representative of RSC Equipment Rentals (Stronger United) identified Snowbowl as the company’s “biggest client.” Much of the equipment and heavy machinery used in Snowbowl’s construction operations has been supplied by RSC, a nationwide corporation. 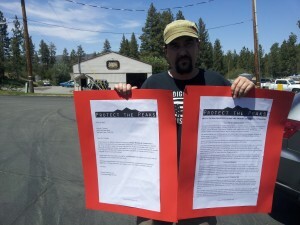 Home feature Corporations Confronted for Roles in Snowbowl Human Rights Violations – Call to Action!